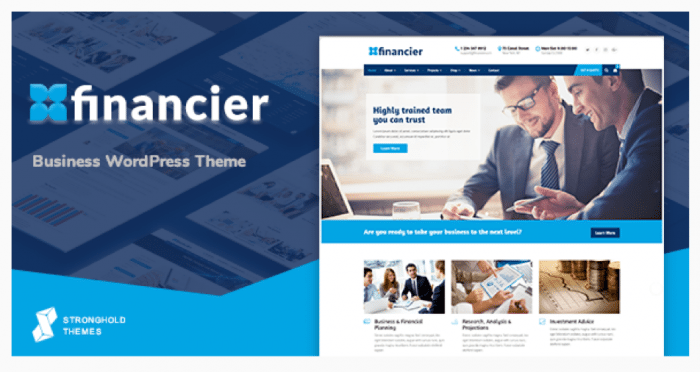 Financier is popular WordPress theme designed for every type of business dealing with finances. It meets the needs of business consulting, law advisors, insurance brokers, and accountants equally well. The theme offers tools to customize the site as the users like. Financier is among the user’s top picks when looking for a finance-oriented theme. The theme gives a very professional feel. Its clean and modern template lives up to the expectation of an impressive, yet a purpose-oriented website. Financier is equipped with a multitude of features that makes sure that your website makes the viewers stay. A visual page builder that enables the users to create a distinctive page for their site. No prior coding knowledge is required. WordPress live customizer that is capable of changing colors, fonts and layout of the website. Quality and user-friendly interface to facilitate the beginners. WooCommerce compatible which is the most commonly used e-commerce plugin around the globe. Multitude of font options by Font Awesome which comes with the theme. One click theme update makes sure that the users are equipped with the latest theme updates. Unlimited color scheme options allow the users pick the colors that look best with the content. Compatible with almost every popular browser such as Firefox, Chrome, Opera, Safari and Edge. Financier offers a powerful page builder that makes the customization hassle free. It offers a very user-friendly theme panel. The theme panel contains fonts, color, and header and footer elements. It offers the users to create full screen and responsive image and video sliders with Revolution Slider. It comes with drag and drop feature for an easy and fast creation of sliders. Its appointment booking system simplifies the process of booking appointments. Moreover, the theme can be integrated with SEO tools. This makes sure that the users are guided to improve the ranking of their site at every level. 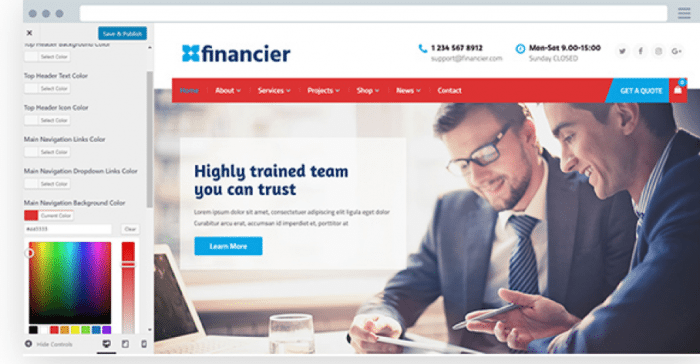 Financier comes with the integration of powerful plugins that facilitate the users to create a perfect finance website. Financier comes with three Homepage layouts to choose from. The users are sure to find one of them, which is perfect for their site. Financier also offers a child theme to provide an add-on to existing theme. Its modification equips the user with better version to stay updated in the online market. The theme costs $59. The price is a winner for the amount of features it offers. The users get all the basic features and extensions compatibility at an affordable price. The theme provides fast and reliable support to its customers. The support is available only through email. Now the question is what makes Financier a theme good enough to represent your brand? We will answer that for you. When looking for a theme, one of the most important things to consider is the frequency of updates. Users normally pick themes that are updated according to the market requirements. Themes that are updated at least once every two months should preferably be chosen. However, Financier goes an extra mile for you. It is updated once every month to make sure that the theme is free of glitches and runs smoothly. The theme has just the right features for setting up a site of your choice. You can pick one type of home page, add widgets and customize anything as you like. Its high resolution makes sure that images will look good on every size of the screen. Moreover, the users can preview how their site will look on different sizes of the screen by hitting the different screen sizes on the top right of the demo page. In a nutshell, Financier does not disappoint. It is well updated, highly responsive, fits different sizes of screen and a complete value for money. Its friendly interface makes it easy to work with. The fact that no prior knowledge of coding is required makes it even easier to use. It is intricately designed and does not miss out any detail required for a finance-oriented website.